Today’s menu has a mild antimicrobial soap for children’s sensitive hands that is very, very easy to make. 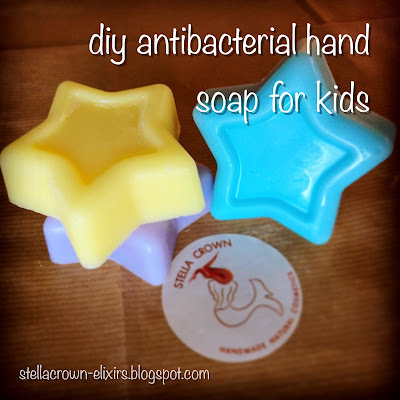 It can be, of course, used by adults too.. As the cold & flu season has arrived, the need for a disinfectant soap has become imminent in order to minimize chances of getting sick; let’s not forget that all germs are on our hands. Before starting the preparation process, sterilize work surface, tools, and equipment. Cut and weigh the crystal soap base SLS free. Cut into smaller cubes and put them in the beaker. Place the beaker in a bain marie at a low temperature. Once the soap melts remove from the heat and add the food coloring of choice. Mix using the whisker. When the temperature reaches 60°C add the oils and the vegetable silicone. Mix again. Spray inside the beaker with alcohol or alcoholic lotion in order to remove any bubbles. Spray the inside of the silicone mold as well. Pour the soap in the mold and spray again. Wait for the soap to cool down and set. This stage can last from 15’ up to an hour or more, depending on room temperature. If in a hurry, put the soap in the fridge for about 20 minutes. Oncee the soap has cooled down, unmold the soap and wrap it in plastic wrap, so it doesn’t lose its fragrance and moisture. The crystal soap base SLS free is ideal for sensitive skin and one of the purest ingredients for children’s skin. Macadamia oil has softening properties and is broadly used in soaps for babies, while early harvest extra virgin olive oil, besides having moisturizing properties, also helps this specific glycerin base to foam. Vegetable silicone is an aqueous extract of Chondrus Chrispus, a kind of seaweed also known as Irish Moss. It is a marine active ingredient that enhances our skin’s hydrolipidic layer and protects from dehydration; 100% herbal product. Lavender and mandarin essential oils are antimicrobial and antiseptic.